In leaked recording, Kerry says that if Israel doesn’t make peace soon, it could become ‘an apartheid state,’ like the old South Africa. In what may be a sign of his frustration over the failure of his peace efforts, The Daily Beast revealed on Sunday that U.S. Secretary of State John Kerry has said that if Israel doesn’t make peace soon, it could become ‘an apartheid state,’ like the old South Africa. The comments were made by Kerry during a meeting with influential world leaders in a closed-door meeting Friday. The Daily Beast obtained a recording of the comments. According to the report, Kerry's use of the loaded term is already rankling Jewish leaders in America. The “apartheid” comment wasn't the only controversial comment on the Middle East that Kerry made during his remarks to the Trilateral Commission, according to The Daily Beast. The website further reported that Kerry also repeated his warning that a failure of Middle East peace talks could lead to a resumption of Palestinian Arab violence against Israeli citizens. He also suggested that a change in either the Israeli or Palestinian leadership could make achieving a peace deal more feasible, and lashed out against Israeli construction in Judea and Samaria. Kerry also said, according to The Daily Beast, that both Israeli and Palestinian Authority (PA) leaders share the blame for the current impasse in the talks. “A two-state solution will be clearly underscored as the only real alternative. Because a unitary state winds up either being an apartheid state with second class citizens - or it ends up being a state that destroys the capacity of Israel to be a Jewish state,” Kerry was quoted as having told the group of senior officials and experts from the U.S., Western Europe, Russia, and Japan. “Once you put that frame in your mind, that reality, which is the bottom line, you understand how imperative it is to get to the two state solution, which both leaders, even yesterday, said they remain deeply committed to,” he claimed. The Daily Beast noted that in a 2008 interview with Jeffrey Goldberg, then-Senator Barack Obama shot down the notion that the word “apartheid” was acceptable in a discussion about Israel’s treatment of Palestinian Arabs. “There’s no doubt that Israel and the Palestinians have tough issues to work out to get to the goal of two states living side by side in peace and security, but injecting a term like apartheid into the discussion doesn’t advance that goal,” Obama said at the time. “It’s emotionally loaded, historically inaccurate, and it’s not what I believe,” he added. State Department spokeswoman Jen Psaki told The Daily Beast in response to the leaked comments that Kerry was simply repeating his view, shared by others, that a two-state solution is the only way for Israel to remain a Jewish state in peace with the Palestinian Arabs. “Secretary Kerry, like Justice Minister Livni, and previous Israeli Prime Ministers Olmert and Barak, was reiterating why there's no such thing as a one-state solution if you believe, as he does, in the principle of a Jewish State. He was talking about the kind of future Israel wants and the kind of future both Israelis and Palestinians would want to envision,” she said. “The only way to have two nations and two peoples living side by side in peace and security is through a two-state solution. And without a two-state solution, the level of prosperity and security the Israeli and Palestinian people deserve isn't possible,” added Psaki. Leaders of pro-Israel organizations told The Daily Beast that Kerry’s reference to “apartheid” was appalling and inappropriately alarmist because of its racial connotations and historical context. “While we’ve heard Secretary Kerry express his understandable fears about alternative prospects for Israel to a two-state deal and we understand the stakes involved in reaching that deal, the use of the word ‘apartheid’ is not helpful at all. It takes the discussion to an entirely different dimension,” said David Harris, executive director of the American Jewish Committee, an organization that has been supportive of Kerry’s peace process initiative. “In trying to make his point, Kerry reaches into diplomatic vocabulary to raise the stakes, but in doing so he invokes notions that have no place in the discussion,” he added. 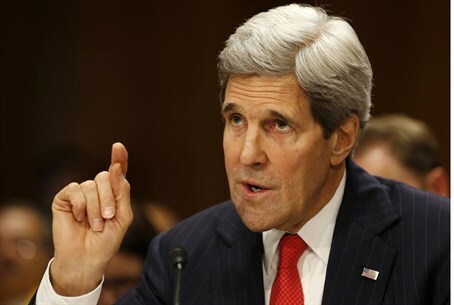 This incident is not the first time that Kerry has pointed an accusing finger at Israel or threatened it over the peace talks, and has caused outrage. In February, he threatened Israel with a boycott if peace talks fail. The remarks were condemned by many Israeli officials, Jewish Home chairman Naftali Bennett, Minister Gilad Erdan and Deputy Defense Minister Danny Danon. Last November, Kerry threatened that Israel would face a "Third Intifada" - or violent uprising - if talks did not end with a "Palestinian state" in Judea and Samaria. According to The Daily Beast, in his comments Friday, the Secretary of State also implied, but did not say outright, that if the governments of Israeli Prime Minister Binyamin Netanyahu or Palestinian Authority Chairman Mahmoud Abbas left power, there could be a change in the prospects for peace. Kerry criticized Israeli construction in Judea and Samaria as being unhelpful to the peace process and he also criticized Palestinian Arab leaders for making statements that declined to recognize the right of Israel to exist as a Jewish state. The leaked comments were made just one day after Israel suspended the peace talks with the PA, after Abbas’s Fatah faction reached a unity deal with longtime rival Hamas. Soon after Israel’s announcement, Kerry called for "compromises" from both sides and declared, "We will never give up our hope or our commitment for the possibilities of peace." On Friday, Psaki denied that Kerry’s efforts to secure a peace treaty had failed, claiming instead that the talks are in a “moment of transition” and Kerry’s team is adopting a "holding period" as the sides decide their next moves.